Seedless vascular plants dominated the Earth until about 200 million years ago. Characteristics of the four phyla of seedless vascular plants are summarized in Table 28-2. The first three phyla are called fern allies, while members of the last phylum are ferns. Spores are the mobile sexual reproductive parts of all seedless plants. The phylum Psilophyta (sie-LAHF-uh-tuh) is represented by whisk ferns, illustrated in Figure 28-8. Despite their name, whisk ferns are not ferns at all. They have no roots or leaves and produce spores on the ends of short branches. These features suggest that whisk ferns resemble early land plants. Some species of the phylum Psilophyta are epiphytes, which means they grow on other plants. But they are not parasites because they do not harm their host plant. The whisk fern produces spores at the ends of branched stem tips. These plants are found in tropical and subtropical regions. The phylum Lycophyta (lie-KAHF-uh-tuh) contains the club mosses, an example of which is shown in Figure 28-9. 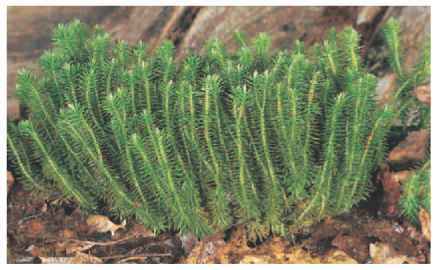 Because they look like miniature pine trees, club mosses are also called ground pines. They produce a strobilus (stroh-BIE-luhs), or cone, which is a cluster of sporangia-bearing modified leaves. Club mosses were once widely collected as Christmas decorations. Another member of phylum Lycophyta is a spike moss called Selaginella lepidophylla, native to the American Southwest. Selaginella turns brown and curls up in a ball during drought. However, when moistened, the plant uncurls and turns green again after a few hours. The club mosses, sometimes known as ground pines, are members of the phylum Lycophyta. The tips of the aerial stems contain conelike structures. This horsetail, of the genus Equisetum, has hollow, jointed stems that contain silica. About 300 million years ago, some species of the genus Equisetum were large trees, growing with large club moss trees and ferns in steaming swamps. Over millions of years, the trees and other plants died, became buried, and turned into coal. Tree ferns, such as the Dicksonia antarctica shown here, look like palm trees but are actually the largest living ferns. Sometimes, epiphytic ferns grow on the trunk of tree ferns. 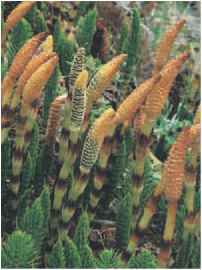 The phylum Sphenophyta (sfee-NAHF-uh-tuh) includes horsetails of the genus Equisetum. Horsetails have jointed photosynthetic stems that contain silica, with scalelike leaves at each joint. The vertical stems of horsetails, which grow from a rhizome, are hollow and have joints. Spores form in cones located at the tips of stems. American pioneers used horsetails to scrub pots and pans; hence, they are frequently called scouring rushes. 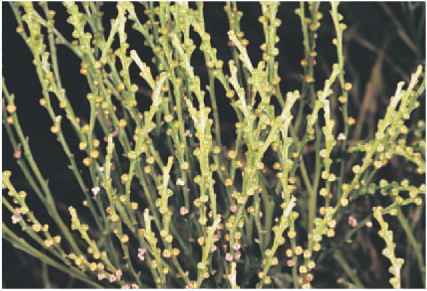 As you can see in Figure 28-10, the shoots are often highly branched and remind some people of a horsetail. Ferns probably originated over 350 million years ago. Ferns belong to the phylum Pteridophyta (tuhr-uh-DAHF-uh-tuh) and represent a diverse group. Some are floating plants that are less than 1 cm (0.4 in.) across. Ferns also grow above the Arctic Circle and in desert regions. 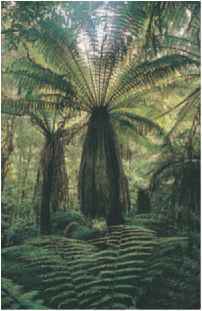 The largest living ferns are tree ferns, shown in Figure 28-11. These ferns can reach 25 m (82 ft) in height, and some have leaves 5 m (16 ft) long. Tree ferns live in tropical and subtropical areas. Most ferns have an underground stem called a rhizome (RIE-zohm). The fibrous rhizomes of a few species of ferns are used as a growing medium for orchids. The tightly coiled new leaves of ferns are called fiddleheads. The young fiddleheads of some species are eaten by humans as a vegetable. Fiddleheads uncoil and develop into mature leaves called fronds.